These board games belonged to my grandparents. 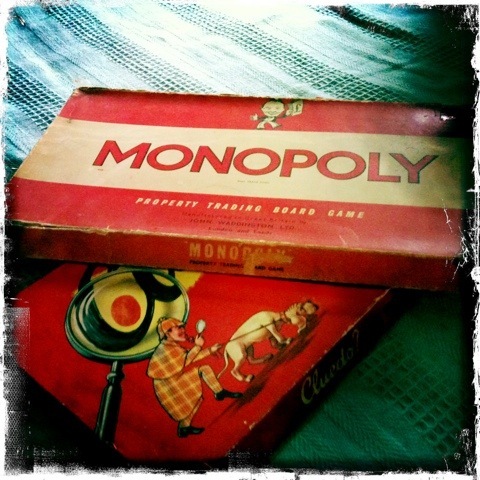 The Monopoly game is the set that my Dad and his cousin broke over a long, cold winter. When I say broke, they had to make new money as they were going round and round the board in a deadlock. When I had my appendix out, I wanted some distraction while I recuperated, I set up Cluedo, and tried to play it on my own. I figured I could work it somehow, let’s just day I did shortly realise I couldn’t not ‘see’ the other cards, I blame some heavy-duty painkillers! I love playing both games, I was the dog when we played Monopoly with my parents and brother. We’d also play endless games of cards and dominos. Now I’m waiting patiently for my son to grow up so we can play board games together. They’ll be even older by then, will probably be viewed as archaic. But one thing Hubs and I want Peanut is not be plugged into a games console all the time. Board games may be old fashioned, but you can have a conversation playing them. PS if I’m ever Banker? I cheat.